The recent Captain America movie brought the red white and blue hero back to screens and to a lot of people it will be the first time they have seen the Captain in a movie. But for the true fans you can’t forget all the old movies which evolved into the First Avenger movie. The 1990 movie wasn’t the first time Captain America appears in a live action appearance, he’s actually been in many since the 1940’s but the 1990 movie was the first to be made for the cinema. It was shot in Yugoslavia which helps since a large part of the movie is set in WWII. The tone of the movie is aimed much more at the younger audience than the recent comic book movies we have had but it still has a few fairly gory scenes with a bloody Red Skull. Some of the scenes are really cartoony but I think that’s just how comics were at the time. For example the rocket the Red Skull built looks like it should have ACME written on the side and the way Captain America is secured to the rocket is classic silver-age comics. One thing I did really like about the 1990 version of Captain America is the pace, they didn’t make films at that time just sell several sequels after it. The movie spends the first third or so in WWII then Captain America saves the White House and ends up frozen in Alaska. He then wakes up in present day America to foil the Red Skulls second attempt to kill the president. With Captain America : The First Avenger we only saw him in WWII apart from the scene at the end when he wakes up in NYC. Then the next time we see him he jumps right into joining the Avengers and we miss the whole bit where Steve Rogers struggles to come to terms with whats happened and meeting Peggy Carter again when shes all old. 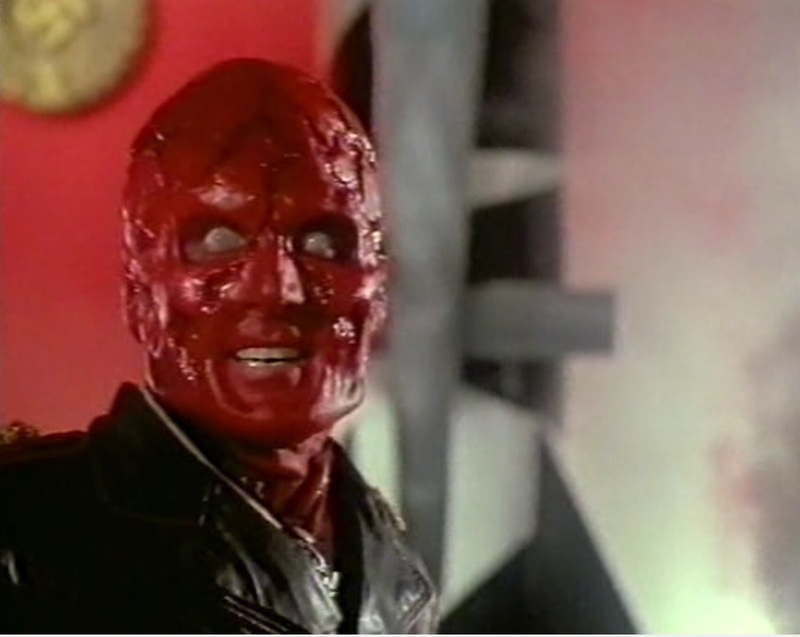 Another cool feature of this movie is when you see Red Skull in present day his face has partly healed up but he’s still majorly scarred. I know Hugo Weaving doesn’t want to return as the Red Skull but I hope they re cast him with someone who doesn’t think they are bigger than they actually are and is happy to just be cast one such an epic movie. It would be great to see Red Skull in present day for another Captain America movie. One trick I think they missed out on with the 2011 version is having the origin of the Red Skull. In the 1990 version he is a young Italian Boy who gets taken by Nazis to experiment on, He also see’s his parents killed much like Magnito in X-Men First Class. You also see the scientist who created the super solider process turn from evil scientist to wanting redemption for what she’s done to the poor kid who they experimented on. Comparing the two movies you can see that the 1990 Captain America movie has inspired parts of the 2011 one. Things like the scene in the lab in NYC look almost identical at some parts. They obviously had to modernize it a lot for a new audience who wouldn’t get a lot of comic references like having Captain America strapped to the outside of the rocket. As mentioned before the 1990 movie doesn’t suffer from them signing Captain America up for a six movie deal and having to spread out events. I really liked seeing him go from the 1940s to present day, Marvel really missed out on that, Maybe if they could have gotten a Captain America 2 movie in before the Avengers it would have worked but throwing him into the Avengers right after he defrosts skips a lot of cool scenes. Overall the 1990 movie is well worth watching if you get a chance or want something to full the gap between now and 2014 for the Winder Solider movie.